This is a very very good album that stands up to repeated listening and reveals hidden gems each time. The backing musicians are the usual suspects Steve Gadd, Nathan East, Andy Fairweather Low, and Doyle Bramhall who have the ability to seamlessly support get they 'stuff' in but never intrude. The selection ranges far and wide, delving into Stevie Wonder's 'I Ain't Gonna Stand For It' through to JJ Cale's 'Travelin Light' to a marvellous version of Charles Calhoun's 'Losing Hand' and Ray Charle's 'Come Back Baby'. What really impresses me about this album is the sheer breadth of material performed so beautifully and with such conviction. I play 'Reptile' regularly and it just seems to stay and stay in my cd player, surely the sign of a really solid piece of work. This is a wonderful album and one that anyone new to Clapton could confidentially buy and not be disappointed with. He occasionally received headlines for some of the wrong reasons but through it all he remains one of the pre-eminent guitarists of our time, one seems able to continue to develop his body of work. Marvellous stuff! Well what more can we say about EC this is a complete album with the best of different styles of music playing by the EC way and his feelings within... like always. This is a great album, I think this may be my favourite album by Eric Clapton. I've read some reviews and they say it lacks an upbeat song, but I guess they didn't listen to 'Superman Inside', an awesome and rocking song. The title track instrumental is also really pleasing to listen to. I find my favourite song is the blues song he put in, 'Come Back Baby'. His vocals are AWESOME! Maybe not exactly Ray Charles, but it definitely is a close match. I also enjoy JJ Cale's 'Travelin' Light', a cool slide guitar song. And for people who say Clapton isn't still god, listen to the songs, I mean LISTEN. You can hear his genius when you really listen. I still think Clapton is unmatched in guitar skills, and all his albums are works of pure genius and god-like guitar playing is to be found in each album. Reptile is one of the more interesting albums of Clapton's career. I feel that by the type of music on the album that Clapton is going through a nostalgic period in his life. The album opens with a spunky instrumental of "Reptile which he did in his live show. Got you on my mind is next and one of the songs I talked about being nostalgic. Travelin' Light to me misses something. The song sounds flat and misses something in the translation. Next is the very light weight "I believe In Life" which does nothing for me and could have easily been scrapped for something else. Come Back Baby is next. Its a Ray Charles classic and is the best song on the CD and one of his best ever. As they say at the end of the song "Lord have mercy" He turns in a performance you will listen to over and over again, alone worth the price of the CD. Broken down is a solid performance and Find Myself is not as strong. I Aint Gonna Stand For It is very average also. I want a little girl is well worth the listen. Second Nature is good, but again not a classic, Next is the James Taylor standard "Don't Let Me Be Lonely Tonight" It has a much different feel as the James Taylor version. Modern Girl and Superman inside are worth the listen. The finale Son and Sylvia that is dedicated to his late Uncle to me is a very strong instrumental performance. It will haunt you. The acoustic guitar is very pretty and the song is very well written. He should have included the concert favourite "Somewhere Over The Rainbow" which he did during the tour for this album. The album is solid, but not one of his classic performances. He does show some brilliance on this CD. Its a must for collectors. I must say, when I first bought this album I was a little taken aback by it. It's not that I didn't like it, and it's not that I loved it at first... It was simply a sound that I wasn't expecting from a Clapton album. The first element I noticed about this album was the overall 'diversity' it showed with each track. All of Eric Clapton's solo albums end up running in the same vein or 'sound/production' to where this one has something for every Clapton fans taste(s). What makes Eric Clapton so unique as a 'musician' is that whatever your taste is in music, he's made an entire album in that genre. Whether it be in Country-rock, Blues, Soul, Pop, Acoustic, Psychedelic, Jazzyesque. He's done it. Up until "Reptile" he had never really recorded and released an album that incorporated all of those styles and in a way, this album represents all of the facets of Mr. Clapton's solo career in one album. The songs range from Rock-pop (superman inside), Blues rock (Come Back Baby, Got You On My Mind), Basic pop (I Aint Gonna Stand For It, Travelin' Light) Acoustic (Believe in Life, Broken Down, Modern Girl, Second Nature) Soulful R&B (I Want A Little Girl), Jazzy (Find Myself), instrumental work/soundtrack esque songs (Reptile, Son And Sylvia) and the bluesy ballad (Don't let me be lonely tonight). What pulls this album together is the production value on each individual song. Though it may pull a new listener away a bit at first listen, It's definitely one that grows on you. This is why I put it at 8 out of 10 for a rating. Can't wait for your new album Eric! You're always surprising us with new sounds on each album. Thank you! I would say over all this is a strong album, and anyone who would compare it to one of those mid-90's albums is not giving it enough credit. Yes it does have a much more pop-like/R&B feel to a lot of the songs. I don't really know how I feel about that. But on some of the songs Eric really shines. I really like the covers of "Don't Want To Be Lonely Tonight" and "I Want A Little Girl" as well as "Find Myself" . Off the top of my head I would say they are probably the best songs on there, but that is just my opinion. And for those of you who have not had the privilege to see the man play live, find some way to do so. I saw him on the tour for this album and it was excellent. I can't wait until the new live album of that tour comes out. It will be a must buy for all Clapton fans. Well, I have bought this Reptile album nearly a year ago and as a big fan of Mr Clapton, my opinion to this album is that it features his new current songs that I never heard before. Great! Excellent! this album is fantastic. He sings from rocks to blues. If I have to choose two best songs in his Reptile, I would choose I Ain't Gonna Stand For It and Superman Inside. Others are not too bad, but they are proof that Eric could sing even more better and harder like Come Back Baby and Believe In Life. When I hears this both songs, the only thing I do is rush to the living room where my dad's hi-fi system located and raise the volume. After that, I take nice seat and think what Mr Clapton had written on the song lyric, about the story of a song. I do say that every songs he written is something behind his life and family. Finally, I do hope him success in career and sing more. This album show how Eric hasn't been the "God of the guitar" of the Cream yet, but is the mild "classic blues" good-tasted of "Unplugged". It's a worth? ! "Reptile" is all you can expect from an Eric Clapton's album in the 90's. But, unfortunately, not much more. Bought this CD after seeing EC live in concert here (Dallas, Texas). 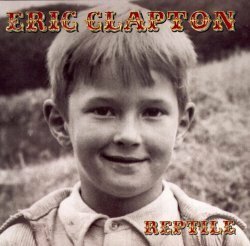 I consider myself a pretty "die-hard" Clapton fan and to me, the first track of this album - Reptile was absolutely phenomenal! Yes, it is not blues and neither is it rock, but instead it is Bossa Nova! This just shows EC's genius and mastery of his domain! I agree - Clapton is still God and probably will be for a very long time to come indeed! This is a really touching and beautiful album. I think in terms of musical versatility. Eric is up there with the true kings: he has covered so many levels in music styles over the years and this album is testament to that. Some say it has a "retro" feel but I think its more traditional, "retro" sound such a horrible word and Eric has even shunned it when talking about this album. The two instrumentals rank up their with his recent soundtrack work and that is indeed a big compliment. All the blues numbers almost sound studio originals from the 50's and 60's, they have such an authentic feeling backed up with great backing vocals and consistent piano. Traveling Light reminds me a lot of After Midnight I don't know why, its just a lilting groovy track. The acoustic numbers are introspective and very touching, "Broken Down" and the superb "Find Myself" are highlights. "Modern Girl" is one of my favorites and I find it to be one of the best songs EC has ever written, just so expressive and "Superman Inside" almost harks back to the days of Journeyman. All in all this is a strongly personal an very heartfelt and expressive album; its emotional power alone makes it so impressive but the vocals by EC (his best up to now) and the versatile song content on offer make this one of Eric's best albums. This one will surely stand the test of time. I know that when some fans read my rating they will get pissed, but this is how I feel. I enjoy the upbeat songs of EC like original Layla but this new sound of Eric in this album is to slow. There isn't one real fast-make-ya-wanna-dance song on the album. Slowhand has returned. This is neither the sissy "Pilgrim", nor the ultra blues (and personal favorite) Riding With The King, this is a whole new (old) animal. It's like the early solo years, back when Clapton didn't want to be a God, it turns you off at first, but the more you listen to it, the more you get its subtle genius. I've always said that Eric Clapton is like a secret club, and this holds true to the rep, once you get past the fluff you get to the real music. I picked this album up after hearing EC live twice this year, his new material impressed me, so i was eager to see how he put them down in the studio. I have to say, EC's voice is flawless on this album, songs that stand out the most vocally are 'Come back Baby' 'Don't let me be lonely tonight' and 'Broken down'. 'Broken down' is a fantastic track, it has a great feel to it, EC plays and sings fantastic and the impressions add a lot to this song. 'Travelin' Light' has two great slide solo's in it and 'come back baby' has a solid blues solo. 'Second Nature' reminds me of 'its probably me' which he did with sting, again great track, and 'Superman Inside', this is a great rock track, reminds me of Derek and the Dominos. Its not the best on the album but EC does a great vocal and its full of great guitar parts, some people have said this song is awful and shouldn't be here, all i can say is what the hell is wrong with you people. Having rushed to the shops on the 5th March to purchase my copy of Clapton's latest, my initial reaction was one of disappointment. But fear not, Reptile is one of those albums that WILL grow on you. The only disappointment was that I wasn't really prepared for the 'retro' feel of this album. But that retro feel is exactly why this record really is a breath of fresh air. The think that strikes most is the impact that the impressions make on this album. Mostly subtle, but as you listen you realise that they add a little spark that gives this record some of that magic that makes you listen to music in the first place. The album is sandwiched between two instrumentals. The first being 'Reptile' a sort of Bossa Nova track, which to be honest doesn't quite work. It's a nice piece of music, but it is certainly missing the magic the rest of the album contains. However, the second instrumental track is the final track on the album and is a different kettle of fish altogether. 'Son & Sylvia' is certainly one of the most beautiful pieces of music Clapton has ever written. Soft gentle acoustic guitars are gradually joined with various instruments including a synthesized harmonic which works surprisingly well. Well quite a few cover versions in this album, the very blues orientated 'Got You On My Mind' followed by the more up beet 'Travelin' Light' another album highlight. 'Come Back Baby', 'I Want A Little Girl' and 'Don't Let Me Be Lonely Tonight' are also included. The latter being another highlight as Clapton can be heard straining for those high notes and yet instead of impeding the song it actually adds to the emotion. The final cover on the album is Stevie Wonder's 'I Ain't Gonna Stand For It' and it is certainly one of the best tracks on the album. One could be forgiven for asking why I have yet to mention any guitar solo's. There are no really big solo's in the album, in fact the piano is used to great effect the whole way through which is what gives it's retro feel. There are some great guitar parts, but all as part of the whole rather than standing out on their own. This though is where the magic of the record comes in to it as there are so many parts to listen out for in each song, you can keep listening to the record in different ways. 'Broken Down' is the prime example of where the impressions transform what would previously have been a possible dull song in to an all singing all dancing track that takes you breath away. My personal favorite is 'Believe In Life', a slow long sounding much like an unplugged track, great sentiment, great melody and just a lovely song. Yet again this track doesn't grab you by the throat, but after hearing it a few times you can't get it out of your head. 'Second Nature' unfortunately sounds very similar to 'Broken Down', but nothing like as good and suffers for being on the same album. 'Find Myself', I would say (and I could be wrong! ), is Clapton's focus of the album being about his relationship with his Uncle. I won't spoil this one for you, but trust me when I say it is nothing like you will be expecting, yet again it is fresh. 'Modern Girl' was originally recorded for 'Pilgrim', but you wouldn't notice, as it slots in to this record nicely. To be honest it wouldn't have fitted in very well with the concept of Pilgrim so it was a good job it was left out. The penultimate track on the album is a collaboration between Clapton and Doyle Bramhall II. Very much more of a rock track, nothing like anything else on the album, yet it fits in. Don't ask me why, it just does. Oh and it's another great track despite the stupid title. All in all another great album, from Clapton, not what I expected, but in this case that is no bad thing. If artist's kept churning out the same stuff all the time we would soon get bored. Not quite as good as 'Pilgrim', but it is so different that it's hard to compare the two. All in all it is yet another must buy from old slowhand. Or maybe I should call him the Reptile!